The 2012 Cadillac CTS is a five-seater sedan with a 3.0-liter 6-cylinder engine. It has a 6-speed manual transmission with rear wheel drive by default, while the CTS Premium model has a 6-speed automatic transmission. Both give an estimated 270-hp at 7000rpm. The 2012 Cadillac SRX, on the other hand, is a five-passenger sports utility vehicle. It has a 3.6-liter V6 engine with front-wheel drive, as well as a 6-speed automatic transmission system. They also released the 2012 Cadillac Escalade, which includes the base model, the 2012 Cadillac Escalade ESV, the 2012 Cadillac Escalade EXT, and the 2012 Cadillac Escalade Hybrid. The base Escalade is a seven-seater sports utility vehicle with a 6.2-liter V8 engine with 6-speed automatic transmission and rear wheel drive. The ESV is a larger cabin variant, and the EXt is a five-seater variant with an open truck bed back end. Awarded to the brand with the highest new car owner design and performance ratings after the first 90 days of ownership. 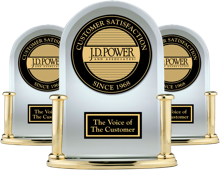 Awarded to the brand who received the highest dealership new car buying experience rating. Awarded to the brand who received the highest customer satisfaction rating based on service for maintenance or repair work.